the "Spirit" was renamed "Pride of Kent". At the end of 1991 P&O decided to rebuilt the ferry at Fincantieri yard of Palermo, Italy; she returned from Italy lengthened by 32 metres and with increased figures of GRT, DWT, passenger and cargo capacity, but her unique ugliness remained the same! She maintained the same link between Dover and Calais for 11 years between June 1992 and June 2003, but she changed her name two times: the first one at the end of 1998, under the alliance between P&O and Stena Line, when she was renamed "P&O SL Kent" and then, at the end of the alliance, from November 2002 to June 2003 she beared the name "PO Kent". When she was bought by G.A. 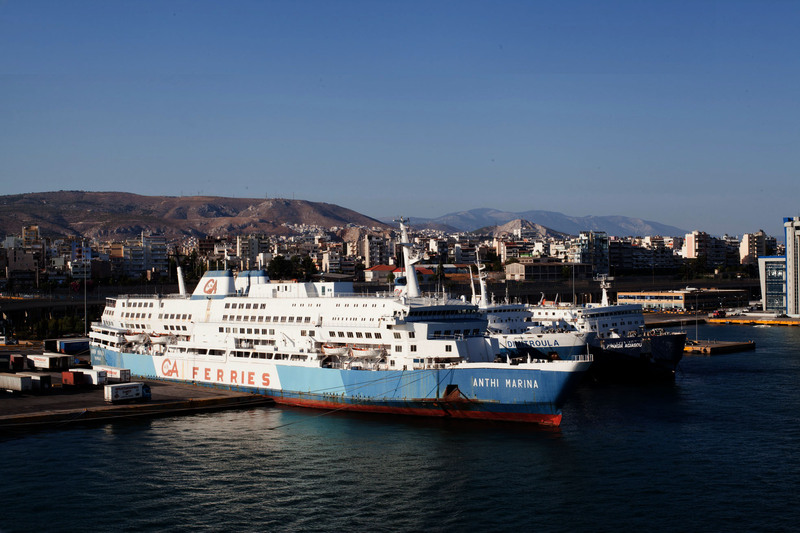 Ferries, the owner Gerasimos Agoudimos was searching a ferry able to front the swift "Blue Star 1" of Attica Enterprises: the solution was this ferry, capable of a maximum speed of 23,75 knots; in fact the "Anthi Marina" sails to Rhodes the same days of "Blue Star 1" departing two hours earlier. I don't know the origin of "Anthi Marina" name, probably it's a spell of "Rodanthi" and "Marina"; in my opinion, as the Greek word "anthi" (anqh) means "in front of" or also "opposite", as I saw in some G.A. Ferries advertisings, this ship is really the opposite of "Marina", both for the ugly exterior appearance and the interiors, typical of a '60/'70's ferry which wasn't converted as a "cruise-ferry". An example of an Italian-built ship which has found her second life in Greece, was purchased by G.A. Ferries in 1997 to substitute the "Dimitra", taken over by DANE. Was delivered to the Italian State-owned company Tirrenia in 1978 as the last ferry of "Poeti" class, formed by eight ferries. In fact, the ferry was not identical with the earlier six vessels, but, as the seventh vessel "Deledda" was younger, had more powerful 16-cylindres Fiat engines and lacked the "lido deck" with swimming-pool, which was fitted on the other six "Poeti" ferries. She was under Tirrenia marks for almost twenty years, serving many routes in the Thyrrenian sea, mainly linking Genoa with Olbia and Arbatax in Sardinia island; was then sold to G.A. Ferries in 1997. The ferry was delivered in Naples and a friend of mine told me many fun stories about Gerasimos Agoudimos; then, in Greece, she started a new service under the new Agoudimos colours, linking along with "El Greco" of Minoan Lines, Thessaloniki and Heraklion, although, differently from Minoan service, was linking many more islands (Skiathos, Skyros, Andros, Tinos, Mykonos, Syros, Paros, Naxos, Ios, Santorini) and once a week calling also at Piraeus. From the following year the Thessaloniki line was performed by "Daliana", so this ferry was diverted to Dodecanese, both on Dodecanese islands line and the long run passing from Heraklion, Kassos and Karpathos, remaining on these lines until spring 2002, when she started the Piraeus – Chios – Mitilini line in "Fedra" 's place. Despite good financial results on summer 2003 is mainly employed on Dodecanese services; instead, since summer 2004, her main service is to Cyclades, Ikaria, Samos and often also to Chios, Mytilene, Limnos and Kavala. Surely, considering her timetable, it would be very hard for her to stole some travellers to Nel Lines.